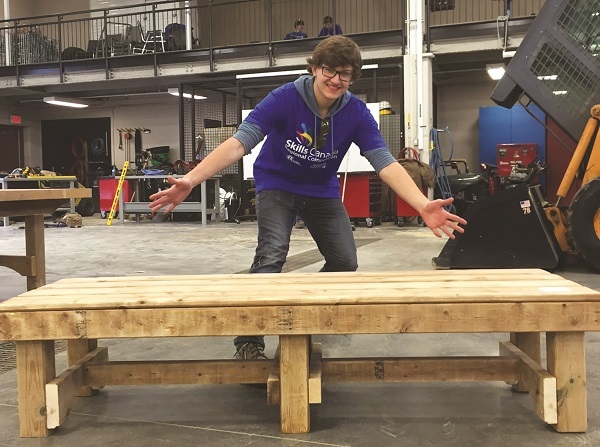 Three Construction Technology students from Centre Dufferin High School (CDDHS) in Shelburne are headed for the nation's largest skilled trades competition. From May 2 to 4, secondary students will compete at the Ontario Technological Skills Competition (OTSC) at RIM Park in Waterloo. Heather Loney Communications and Community Engagement Officer for the Upper Grand School Board, says the Region will be represented by students from Centre Dufferin DHS, Centre Wellington DHS, Erin DHS, John F. Ross CVI, Norwell DHS, Orangeville DSS, and Wellington Heights SS, competing in home and team building, robotics, architectural technology and design, automotive service technology, cabinet making, team and individual carpentry, computer aided manufacturing, electronics, graphic design, hairstyling, IT and network system administration, job interview, photography, precision machining, TV and video production, welding and workplace safety. “Wesley and Jett will now be heading to the Provincial Skills Competition on May 3,” says Greenfield. “They will arrive at 6 a.m. and by 8 a.m. begin construction of an unknown project competing against all other Gold medal winners from across the province. Results of the competition “will be announced during the closing ceremony on May 4 says Ms. Loney. OTSC is free to attend and open to the general public. Congratulations to all three competitors and best of luck to Wesley and Jett from the staff and students at CDDHS and the Shelburne Free Press.